Since May 5th the internet has been ruled by Donald Glover’s music alias Childish Gambino. 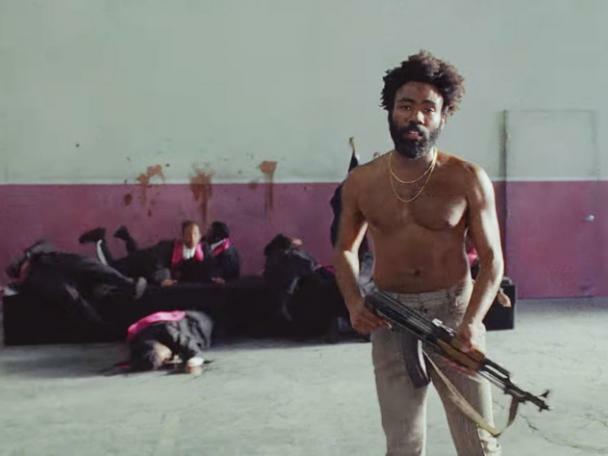 In the heart-stopping music video for ‘This Is America’ - directed by Hiro Murai and premiered on Saturday Night Live - Glover guns down several black musicians before dancing at the foreground of a police riot. It’s pandemonium. Donald Glover’s four minute video has us talking about racial discrimination, police brutality against black people and the West’s digitally-fuelled apathy in one fell swoop. There’s another reason however that I can’t stop thinking about This Is America; I’m white. I'm a white music journalist whose career is indebted to black music. The art form of music journalism is dependent on the artistic output of others; it's our responsibility to broaden conversations about cultural and social commentary that spur from musicians who are holding a mirror to the world. In the case of ‘This Is America’, some of the primary conversations that arise are plain to see. Glover is giving us a cue to talk about gun crime, the toxicity of America’s racial discrimination and police violence - are you listening, Trump? When a track or music video drops with such stark cultural and social relevance, it provides a therapeutic tool for us to open new conversations about real life problems - those that mass media are so good at distracting us from. These conversations are for everyone, irrespective of race, colour, gender, sexuality and music tastes. In his video, Glover reflects world problems that we should address with conversation, listening skills and unity. However, some reviews (by white and black journalists) have been unsavoury. An article in the Guardian theorises over Glover’s supposed commentary on the black experience, psycho-analysing his intentions with comparisons to the racial caricature Jim Crow. Of the lyric “Grandma told me: get your money, black man”, Ben Beaumont-Thomas proposes that Glover could be “tired of the pressure to accumulate wealth, to be performatively black”. Perhaps that's for Glover to say. Black writers have also commented on Glover’s potentially deliberate theme of minstrelsy, including controversial writer Armond White. In his article he explores this topic in detail and accuses Glover of encouraging “political paranoia”.Meanwhile, various music sites have left topics about racial politics only lightly touched, instead providing other kinds of commentary around the track’s sonic qualities and the career trajectory of a rarely-stationary Glover. Whilst space on the internet is infinite, there are a finite number of music websites that are turned to for commentary when a music video stops us in our tracks. Should white music journalists step to the side in moments like this? No, not necessarily; inclusive commentary and discussions are healthy and should be promoted. Perhaps however, white music journalists such as myself should draw a line in how far we dissect the racial commentary of an artist who’s personal perspective and experiences are so different from our own. The intensity of analysis that some white journalists have provided into the video’s racial commentary is not only unsavoury; it reflects the lack of diversity at some publications. As music journalists, it is our place to elevate and give a platform to music that presents difficult topics for discussion. As white music journalists, it is not our place to theorise what a black artist has to say about black identity. If pop music is a reflection of society then we should step to one side to allow those whom it reflects to give us the broadest picture.